Devery Prince Insurance, serving families in greater Anchorage and Wasilla, AK with their ongoing community involvement program, launches a fundraiser for Covenant House Alaska in support of their mission to provide safe, secure shelter and other services for the area’s homeless youth. 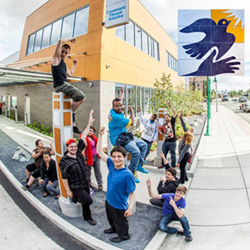 We’re thrilled to team up with Covenant House Alaska. They enable our most vulnerable kids – those who have been abused and abandoned – to find help, hope and ultimately, the skills needed to achieve independence and get off the streets. Devery Prince Insurance, a full service firm serving families from offices in Anchorage and Wasilla, AK, continues their commitment to act as Agents of Change in the community by announcing a fundraiser for Covenant House Alaska, which provides compassionate care and safe, secure shelter for homeless youth. Donations are now being accepted at https://www.covenanthouse.org/help-the-homeless/monthly. Covenant House was established in 1972 with a mission to help homeless kids escape the streets. Today they are the largest privately funded charity in the Americas providing loving care and vital services to homeless, abandoned, abused, trafficked and exploited youth. In addition to hot meals, warm showers and clean beds, Covenant House strives to address the deep-seated psychological, physical and economic reasons for youth homelessness. Teaching kids how to build trusting, respectful, honest relationships, they also provide healthcare, drug abuse and prevention programs, legal services, educational support, GED prep, job readiness and various skills training. Last year alone, Covenant House Alaska provided the area’s at-risk kids with over 12,000 safe beds for the night and more than 2000 health service visits. The caring team at Devery Prince Insurance is busy mobilizing its vast network of professional and personal contacts, and has dedicated a full page of their monthly magazine to featuring the campaign. The electronic version of Our Hometown magazine may be viewed here: http://www.deveryprince.com/Our-Hometown-Magazine_43. The agency itself has pledged to contribute $10 to Covenant House Alaska for each and every person recommended to them for an insurance quotation, with no purchase necessary. Committed to fulfilling their promise to foster positive change within the community, Devery Prince Insurance will choose a new group, family or individual to receive their support every two to three months. Concerned members of the community are invited to submit ideas for consideration of future campaigns through this link: http://www.deveryprince.com/Submit-A-Community-Cause-Idea_49. Selected causes will be contacted by a representative of Devery Prince Insurance’s Community Program. Information on past community causes supported by the agency may be found by visiting http://www.deveryprince.com/community-cause. Readers who would like to learn more about the agency’s products and services may do so at http://www.deveryprince.com/. For more information on Covenant House, visit https://www.covenanthouse.org/. A full service insurance firm serving families from offices in Anchorage and Wasilla, owner Devery Prince is committed to bringing local people an agency which understands their needs. Prince and his team of caring professionals work with carriers to assemble a variety of products and services which will ensure their clients’ peace of mind. From all of the products a typical consumer needs (home, auto, boat, ATV, etc. ), to preparing strategies for long-term financial success, Devery Prince Insurance delivers consistently superior service. Their dedicated agents may be reached by calling 907-279-9000 (Anchorage) or 907-746-9000 (Wasilla).